Ian Chadwick is a Toronto-based freelance writer and editor who, by the time you read this, should be with his wife Susan, soaking up some rays on the beaches of Mexico, drinking cold Coronas and eating spicy tacos. A while back I wrote a somewhat critical review of Universal Military Simulator (UMS). That review caused the publisher some consternation, in part, because it had some errors in it. I'm going to address those errors now and eat a few words. UMS is not rehashed C64 software. I apologize for suggesting that this was the case. 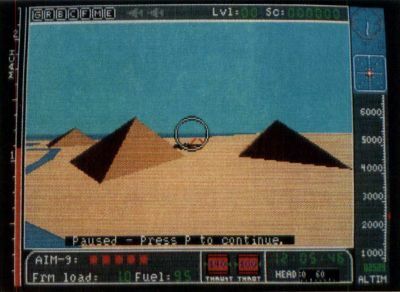 In the original press releases, a C64 version was mentioned. It never came about. I mistakenly assumed that, given the graphics, UMS was an upward port from the C64. According to Rainbird, it was developed on the Atari ST.
And according to Rainbird, UMS allows 60 units per side, not 24 as I originally stated. It does not say this in the manual. It does say: "An army may contain up to six wildcard or user-defined units in addition to the 18 predefined units." However, it seems they meant "unit types," not units. There can be more than one unit of a given type, something not well explained in the manual, and I only discovered how to do this later by accident. The review was the center of a minor storm of controversy on DELPHI'S ST-Log Forum; not so much for what I said (some agreed, others didn't), but whether or not a reviewer should review only products he likes. In other words, if you haven't got anything good to say, say nothing at all. I don't agree with that approach and, I was pleased to note, neither did anyone else on the Forum, even those who thought my conclusions about the game were wrong. More importantly, I received the support of the ST-Log staff, who have a commitment to integrity in publishing and will publish a critical review—as long as the facts are right. SubLOGIC was kind enough to send me its latest products, including the new Western Europe and Japan scenery disks, plus Jet, its F16/F18 flight simulator. For those of you who have wondered, the ST scenery disks are all "enhanced." It used to call them "Star scenery disks," but we don't have to worry about that sort of distinction now. We get the best of the lot automatically. Now you should know from previous columns that I like FS2 a lot. I've spent many pleasant hours flying over the binary countryside, exploring, soaring and, of course, crashing. Still, despite the occasional aerial acrobatics that plant me in the ground, I really do enjoy the program and find it very relaxing, as well as entertaining. My biggest complaint has always been the lack of Canadian scenery. Yes, I know that the Detroit-area scenery disk included a whole chunk of Canada, even Toronto (alas, my house is missing), but it was blase, colorless (that's colourless, in Canada), and unconvincing. I wanted more. Now, contrary to popular belief, Canada is not entirely made up of featureless tundra or windswept, treeless plains (it only looks that way from the air). So I wrote to SubLOGIC and asked for its file format. The company didn't send it to me. I wanted to create my own scenery files and fill in the data to make a detailed flying environment. Well, soon I'll be able to do just that. SubLOGIC is going to release a scenery-creation utility. Although it couldn't tell me for sure, it may even permit adding detail to existing scenery files. Hooray! For me, that's a tinkerer's delight. As soon as I get it, I'll start to work. Watch for my custom-designed scenery files on DELPHI. JET, SubLOGIC's F16/F18 FLIGHT SIMULATOR. Oh, yes, Jet. Well, I haven't had much time with it; so it's not fair to review it in detail yet, but I like what I see so for. It's very different from FS2. For one, the Jet controls are super sensitive, and my first dozen or so efforts got me up but tumbling. I crashed a lot. However, once I managed to stabilize, I enjoyed the ride. Boy, you sure go up in a hurry—and down! Jet's main attraction, as I see it, is the ability to actually dogfight with another ST user through a modem or null-modem link. This is great! I only wish they had a version of FS2 that allowed dogfights, not merely mutual flight. I'm a tad more comfortable in the slower prop planes than a missile-laden F16. However, the latter is preferable over gridlocked highways at rush hour. So far, I haven't managed to land in one piece, a minor drawback (what's $30 million worth of aircraft anyways). And forget the carrier scenarios. I have to practice a lot more before I can land on one of those rolling, shifting demons! And if you were wondering, Jet also works with the scenery disks, so you can really have dogfights over Broadway! Have I ever mentioned my problem with the ST keyboard? My AT and laptop both have keys that measure 12 cm wide by 14 cm high, with a 6-cm gap between keys (almost 7 cm on the AT). These are typical measurements for the PC/MS-DOS keyboards, based on the ergonomics of the IBM Selectric typewriter. My Smith Corona electric has keys 13 cm square, with a 7-cm gap. All of these keyboards are easy to use, with keys well-spaced and small enough so that big fingers don't bang several keys at once. The ST keys measure 15 cm square, with only a 3-cm gap between them. That's a key gap 25% larger with 50% less space between it and the next key. Bump, slam. My fingers always hit more than one key on it. It's a touch typists' hell. I make so many typos on the ST that I stopped using it for writing. My messages on DELPHI are riddled with typos, because I still use my ST for telecommunications. But I don't make a tenth of the mistakes on any other keyboard that I make on the ST. And I'm not alone. I've seen this thread on CompuServe and know others share the same problem. And then there's the tactile response—the springiness of the keys. The ST keyboard is mushy, and although the Mega keys seem much better (I haven't measured the Mega key size), it's still sloppy. I don't care for the mechanical click some PC keyboards have—they make sounds like rats running on a linoleum floor. But I do like the solid resistance they offer. Why doesn't anyone offer a new ST keyboard? I've seen ads for a revamp kit that adds the spring, but no one offers redesigned keys in the proper shape I think the keyboard alone is a significant stumbling block to getting the ST accepted in the business or professional world. Okay, let's talk about business. Do I hear some groans? Come on, this is important stuff. It doesn't mean just the Fortune 1000 as one reader suggested. Business means any commercial enterprise or professional use, be it a dentist's office, a retail store, an accountant, stockbroker or a writer. Hands up anyone who can tell me why the PC/MS-DOS systems are so successful in the business marketplace What do they have that the ST doesn't? Yes, I know, software, but I've ridden roughshod over that path before. What else? Okay, you in the back. The Mega ST has one slot. And that slot isn't anything even akin to anyone else's standard. Has anyone seen the tech specs for the slot? I haven't. Right now, I can buy a PC/MS-DOS machine, get a super high-res card and color monitor and work in at least 1,280 by 800-pixel resolution, maybe go up to 1,600 by 1,200, 1,200 by 1,664 or higher. Even with the Mega, I'm limited to 640 by 400, monochrome—that's not even as high as the Hercules Graphics standard on the PC. My own AT sports a 2-mb RAM card, a multi-graphics card (which can push my multi-sync monitor to about 800 by 500 resolution) and a mouse card. I'm looking into getting a fax card, another 2 mb of RAM, an optical scanner and a hardcard (a hard disk on a card), all available at any run-of-the-mill computer store. I can also get network links, printer buffers, telephone answering machines, additional drive controllers, bar code readers, tape backups, modems, laser-printer drivers (one that even gives HP LaserJets a post script capability!) and other cards. What cards can I add to a Mega? Time's up. Have you seen any? Cards aren't merely the method for expansion, they're also the means to customize your system to suit your own needs. That's what open architecture is all about. One slot doesn't make it as far as "open" is concerned. Of course, there's Apple selling its slot-less Macintoshes in their various configurations. One of the reasons the Mac has only achieved a lukewarm success (compared to the PC system) in the business world is that most of the variations have no expansion or customizing capability, while the PC has oodles of it. Only the SE sports a single slot. Wow. However, Apple has pounded the pavement long enough and got its foot in enough doors that it's managed to sell lots of Macs to people easily convinced they'll never want to expand or change or customize anything. Hardware off the cookie cutter. Where's the ST in all of this? A game-machine? Fie on you! Stand in the back of the class with your nose to the wall. Not that there's anything wrong with games or entertainment. I think the computer's potential for entertainment is highly underrated by the pundits of the computer world. It's no worse than flaking out in front of TV sitcoms and can be a lot more intellectually stimulating. I myself often take a load off the grey matter by spending a few hours playing games on my ST.
What's wrong with the game-machine image? Well, for one, it won't sell many systems. And that's what the bottom line is all about. And guess what? Computers sell better in the business market than in the home market. Around 1984, that was a hard lesson for many manufacturers to learn. I wonder if Atari has learned it yet?